Our pick of the best pencils for artists – from the best mechanical pencils to the best colouring pencils, drawing pencils and more. Find the best pencils for a specific creative task can be tricky. Do you need coloured or monochrome pencils, soft or hard? Believe it or not, there's a plethora of choice when it comes to the humble pencil, and whether you're a professional artist or you're just learning how to draw, the tool you choose can make a huge difference to the outcome. 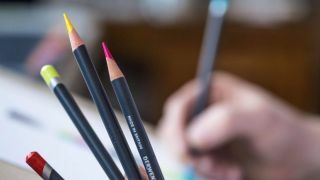 So whether its the best mechanical pencils, drawing, colouring or watercolour pencils that you need, this guide has an option for all budgets. Scroll down to see our pick of the very best pencils for artists and designers. These are the tools you need to create the best pencil drawings (and once you've picked your pencil, why not pair it with a designer notebook?). This beautiful Rotring Rapid Pro metal drafting pencil is truly one of the best pencils for pros. It features a hexagonal body and a circular cross-hatch metal grip, as well as a full metal body designed to balance the weight. The cushion point mechanism allows the sliding sleeve to give slightly under pressure, reducing the risk of lead breakage while writing. The pencil also includes a clip and eraser under the cap. It's a fantastic mechanical pencil for designing layouts and typography. The Faber-Castell Grip 2011 mechanical pencil has won several design awards and its popularity is well deserved. Drawing with this wonderful mechanical pencil comes second nature thanks to a perfectly sized triangular barrel. The raised rubber dots allow for a firm and comfortable grip, ideal for precise drawings. This pencil comes in a range of different colours (as well as the blue shown above, there's silver and black available), all with a handy extra-long twisting eraser and 0.7mm HB lead. In the pencil world, Blackwing has an impressive pedigree. It developed something of a cult following before being discontinued in 1998. In 2010, Palomino bought the brand, and the result is more than worthy of the Blackwing name. There are three main pencil options to choose from: the Blackwing (similar to a 5B), Blackwing Pearl (4B) and Blackwing 602 (3B). The leads have wax added to them, making them super-smooth to use, and create velvety dark marks. We gave them five stars – you can read our Palomino Blackwing pencils review here. The price you see here is for a set of 12, which is not bad value at all for such good quality kit. No, you haven't misread that price. And yes, that's the correct picture. The Caran D'ache Graphite Line gift box really does come with fewer than 20 pencils, plus graphite sticks and accessories, at a price that would make even Jeff Bezos blink, but what you're paying for here is top-quality graphite. The Graphite Line range has been carefully developed and perfected in the Geneva workshops of Caran d’Ache to explore all the different shades of black and deliver thick and thin lines, gradation, flat-wash, blurring and watercolour effects. It's an insanely expensive set of pencils, but we suspect that once you've tried it, you won't want to use anything else. For a much more reasonable price, this set of hexagonal design pencils from Lyra's Rembrandt range is the ideal way to unleash your shading skills. The full Rembrandt Art Design set covers 17 grades from 9B to 6H, and this box features a good, representative sample, enabling you to really get creative with your shading. Each pencil is encased in pure cedar wood and packs an ultra-fine graphite lead that's also suitable for more rigid technical drawing techniques. The Cumberland Pencil Company has been making some of the best pencils around since 1832, and it shows in the quality of its Derwent brand. These pencils, which are sold individually and in sets, make smooth, easy lines on the paper. They're ideal for bold line drawings as well as freestyle sketches, and you can select the set that suits your artistic style. As an alternative to using a pencil for sketching and illustration, have you considered experimenting with graphite powder? Cretacolor's powder is made using a special deep-firing method to produce a dense, rich charcoal. The graphite powder produces luminous light and dark shades of grey, it slides easily, smudges, blends, and rubs off like chalk. Fixative must be used on the final artwork and is suitable for wet or dry techniques on paper or canvas. For some inspiration on how to use this medium, take a look at artist Kelvin Okafor's spectacular portfolio of drawings. High levels of pigment help these pencils stand out. Derwent is well known for making good quality, reliable pencils. Procolour is its latest range of colouring pencils, released in 2017. The pencils themselves feel substantial, with a sturdy circular shaft. The leads aren't too waxy or too brittle and have a high pigment level for wonderful gradation of colour, even with a light touch. We gave them four and a half stars in our Derwent Procolour review. If colour is your thing, you can't go wrong with this beautiful set of colouring pencils from BIC Conté. These high-quality coloured pencils are made of synthetic resin rather than wood, which makes them completely splinter-free should they break. But this is definitely not a case of style over substance, as these pencils also boast a 3.2mm pigment-based lead, providing smooth, even and consistent coverage for artists of all types. These are the best coloured pencils for students and entry-level artists. Soft, thick cores create a smooth colour laydown for superior blending and shading. The Sanford Prismacolor Premier pencils are a true art medium with thick, soft leads containing brilliant permanent pigments that are smooth, water-resistant and lightfast. Colours are easily blended on all art surfaces to form an infinite variety of hues and shades. Their thick leads resist breakage so you can be as dramatic as you dare. Staedtler claims to have invented the colouring pencil, so it should know a thing or two. These watercolour pencils come in sets of 12, 24, 36 and 48 (the price here is for the 24 tin), they have high-pigment, break-resistant leads and a good quality wooden shaft that sharpens well. Of course you can use them dry, or add water for extra fun. Staedtler is reliable brand and this is a great option for beginners or more advanced artists. We gave these five stars in our Staedtler watercolour pencil review. This set of watercolour pencils is named after the famous German artist Albrecht Dürer. These are very carefully made using only the highest quality materials, including vibrant pigments and a unique binder medium, and boldly claim to offer over 100 years of fade resistance. These pencils are perfect for both drawing and painting techniques. They come in tins of 12, 24, 60, and a full range of 120 watercolour pencils, and are a solid choice for any artist. These CarbOthello pastel pencils offer the level of quality we expect from STABILO. The 24-pencil set includes a decent spectrum of colours, and the pencils sharpen very well. The pencils' dry stroke is perfect for blending, but the fun really starts when you begin adding water – you can create some particularly interesting results by working in wet areas with dry pencils. This is a great mid-level set of pencils, but might be a bit advanced for beginners. Read our full CarbOthello pastel pencils review.